Let’s start with FMCG. We have taken 20 companies instead of 15 that we took last year. Let’s jump to the numbers straight away. Please note that since NO FILTER was done for functions in the company, the numbers below include alumni in Sales & Marketing, Operations, IT, Corporate Finance, HR, Others. Disclaimer : It is user generated data. We cannot vouch for 100% accuracy. But it gives a very clear trend. The numbers below do not include most Class of 2013 graduates as they have not started work/not updated their LinkedIn profiles yet. 1) ISB is a weak FMCG campus and lends more support to the theory that FMCG companies like to catch them young. Professionals hoping to switch to FMCG/Marketing post-MBA after more than 3 years of work experience need to know that it is going to be tough. 2) 65 of the 314 professionals from XLRI above are from the HR domain. Our experience tells us that the number could be considerably more than 65. Aspirants should be advised that traditionally placements at XLRI for the HR programme are better than the placements for the BM programme. 4) FMS and JBIMS have a strong legacy and always seem to have good number of FMCG companies visiting their campuses. But alumni numbers are not very impressive especially for JBIMS. XLRI and SPJIMR have done better with a similar batch size over the years. Based on the experience of IIM Lucknow, it would not be very audacious to predict that IIM I and IIM K will also eventually start doing better than FMS and JBIMS at FMCG in numerical terms. This is also aided by the fact that both these IIMs will have bigger batches. By 2018, we predict that alumni in FMCG companies from IIM I and IIM K would be double than those from JBIMS and more than those from FMS. 5) Given that COO of Unilever and CEO of HUL are from JBIMS, the number of alumni from JBIMS at HUL is quite low. Looking at some other schools in India not covered by us (yet), we see the following noteworthy figures for specific FMCG companies. Of course, no filters were done for profiles or designation. Let us look at the other important sectors now. Rock star technology and e-commerce names will increasingly dominate placement reports. Electronics and Telecom companies are always important and hiring numbers are steady as they are for FMCG and General Management roles. We listed 15 companies to be analyzed. Please note that since NO FILTER was done for functions in the company, the numbers below include alumni in Sales & Marketing, Operations, IT, Corporate Finance, HR, Others. Disclaimer : It is user generated data. We cannot vouch for 100% accuracy. But it gives a very clear trend. The numbers below include professionals who could have done short courses. The numbers below do not include most Class of 2013 graduates as they have not started work/not updated their LinkedIn profiles yet. 1) The story changes completely for ISB when one looks at numbers here. 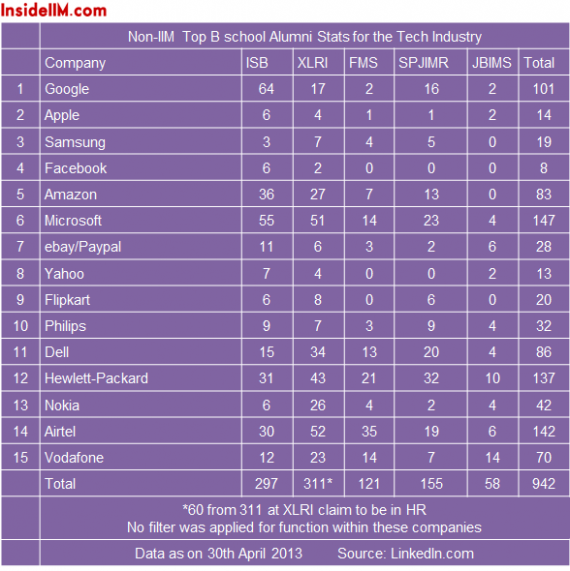 ISB literally owns Google with most business schools in India not even having half the alumni of ISB at Google (IIM C has 36). In general, the performance is exceptional at Google, Microsoft, Amazon. 2) SPJIMR surprises again and trumps IIMs K,I and also FMS and JBIMS. 3) It is interesting to note XLRI’s dominance at Nokia. 4) In general, FMS seems to do well at companies headquartered in the NCR region whether it is Airtel here or Reckitt Benckiser and Pepsi in the FMCG table. Looking at some other schools in India not covered by us (yet), we see the following noteworthy figures for specific companies from the list above companies. Of course, no filters were done for profiles or designation. Oh…awesome analysis! !….Can someone tell me how the following conclusion has been arrived at?.. "Aspirants should be advised that traditionally placements at XLRI for the HR programme are better than the placements for the BM programme." Comparing placements of HR course with those of BM course is an apple-orange comparison. Nonetheless, the above article is insightful, especially the inferences/conclusions. These are words of XLRI alumni associated with InsideIIM.com. The BM programme was born in the 1980s. Historically, a lot of companies only visit XLRI for HR roles and not business roles. On LinkedIn, not everyone classifies themselves as HR professionals. If XLRI agreed to release separate placement reports for BM and HR, the conclusion would be reached by many. 1. The BM program started in 1968…not 1980s. 2. I agree that during the 1970s & 1980s , a lot of companies would have visited XLRI only for HR roles. But that is not the case anymore. 3. 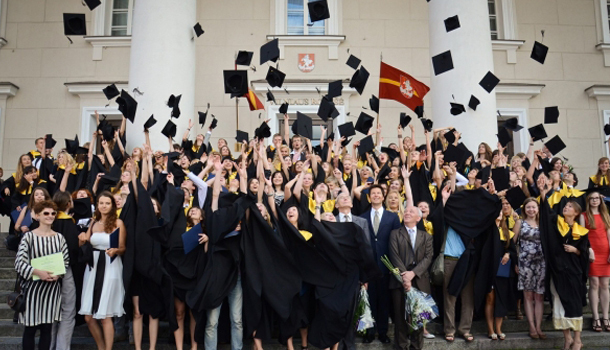 Novartis is a coveted role for which HR students are taken. At the same time,there are companies like BCG that pick BM people only. I am not spreading any negativity. Just mentioning the facts. Beg to differ here. If my memory serves me right, the BM program was started in 1968. I think an average BM job is as good as the average HR job. But yes, the most coveted ones (such as novartis)goes to the IR guys..But on the other hand, a Carlyle or a Rothschild, whenever they visit campus, would always recruit a BM guy…Wish XL provided the BM/IR split in their placement reports.. Yes. I too wish XLRI releases separate reports for BM & HR so that people get to know the facts. Till the point we dont do that, this minconception that XLRI is good only at HR placements will remain. But I am surprised by the fact that even insideiim is of the same opinion. There is no misconception that XLRI is only good at HR. XLRI is very good for business management and large majority of students choose XLRI BM over many other IIMs. However, it is tough to dispute that HR placements are not better than BM at XLRI. The placements of both BM and Hr are at par ..Infact BM guys have better chance of going to Mckinsey plus TSMG and BCG recruits only from BM and so does cognizant business consulting …. The number of SIBM Pune alumni in Castrol is pretty impressive as well, next only to XLRI. There 10 Alums in Castrol from XLRI and you are saying SIBM number is next only to XLRI. What exactly is your point? If I am not mistaken Coca-Cola India doesn't visit SPJain. I believe the report has accounted for HCCB in its estimate of number of employees in Coca Cola. Having said that, the report is clearly indicator as to how placements are in non IIM B-Schools. Commendable effort by the team to churn out these results. Dear Inside IIM, As a former summer intern of the company i believe I have a better understanding of the people at the company and their alma mater. and that is exactly why i'd like to point out that Coca-Cola is dominated by people from XL and FMS. But I daresay we were introduced to more than 5 alums from FMS. I believe people from the company will also testify to this. However since this data has been obtained from LinkedIn, there is a possibility that you must have missed out on a few. However I did not account for lateral movements when I made that comment on SP Jain. Cheers. The same can be said about a few other companies as well. But then again if alums don't update their LinkedIn profiles, there is nothing much that you can do about it. Why does insideiim not include MICA? Why haven't been SCMHRD included? It is doing almost as well if not better than SIBM for sometime now. And for HR, its very comparable to TISS. 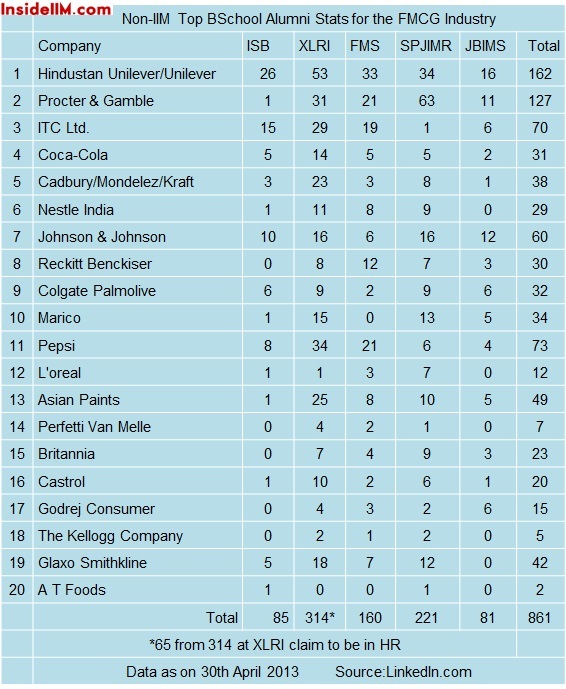 Leading FMCGs (including HUL,PnG,ITC,Kraft,GSK-CH) visit it every year and pick up numbers. Hmmm.. i guess thts where both SIBM and SCMHRD loses out. They are much better than any of th other symb insti, but their brand is diluted with Symbiosis written and clubbing all colleges together. Anyways, it would be great if a comparative study in HR done. I am sure XLRI, TISS and SCMHRD will be right up there. Though I believe SIBM, due to it being a very old college, will have people in imp positions too. The no of alumni in GSK from SIBM Pune would be highest. The count is somewhere around 35 (Just for SIBM Pune). As far as Linkedin trends are considered now you might be able to see data separately for SIBM Pune.